This article is about the 3rd-century Christian martyr. For other people or places called Saint Lawrence, see Saint Lawrence (disambiguation). Saint Lawrence or Laurence (Latin: Laurentius, lit. "laurelled"; 31 December AD 225 – 10 August 258) was one of the seven deacons of the city of Rome, Italy, under Pope Sixtus II who were martyred in the persecution of the Christians that the Roman Emperor Valerian ordered in 258. Lawrence is thought to have been born on December 31, AD 225 in Valencia, or less probably, in Huesca, the town from which his parents came in the later region of Aragon that was then part of the Roman province of Hispania Tarraconensis. The martyrs Orentius (Modern Spanish: San Orencio) and Patientia (Modern Spanish: Santa Paciencia) are traditionally held to have been his parents. Lawrence encountered the future Pope Sixtus II, who was of Greek origin and one of the most famous and highly esteemed teachers, in Caesaraugusta (today Zaragoza). Eventually, both left Spain for Rome. When Sixtus became the Pope in 257, he ordained Lawrence as a deacon, and though Lawrence was still young appointed him first among the seven deacons who served in the patriarchal church. He is therefore called "archdeacon of Rome", a position of great trust that included the care of the treasury and riches of the Church and the distribution of alms to the indigent. St Cyprian, Bishop of Carthage, notes that Roman authorities had established a norm according to which all Christians who had been denounced must be executed and their goods confiscated by the Imperial treasury. At the beginning of August 258, the Emperor Valerian issued an edict that all bishops, priests, and deacons should immediately be put to death. Pope Sixtus II was captured on 6 August 258, at the cemetery of St Callixtus while celebrating the liturgy and executed forthwith. After the death of Sixtus, the prefect of Rome demanded that Lawrence turn over the riches of the Church. St Ambrose is the earliest source for the narrative that Lawrence asked for three days to gather the wealth. He worked swiftly to distribute as much Church property to the indigent as possible, so as to prevent its being seized by the prefect. On the third day, at the head of a small delegation, he presented himself to the prefect, and when ordered to deliver the treasures of the Church he presented the indigent, the crippled, the blind, and the suffering, and declared that these were the true treasures of the Church. One account records him declaring to the prefect, "The Church is truly rich, far richer than your emperor." This act of defiance led directly to his martyrdom and can be compared to the parallel Roman tale of the jewels of Cornelia. On 10 August, Lawrence, the last of the seven deacons, and therefore, the ranking Church official, suffered a martyr's death. By tradition, Lawrence was sentenced at San Lorenzo in Miranda, imprisoned in and baptized fellow prisoners at San Lorenzo in Fonte, martyred at San Lorenzo in Panisperna, and was buried in San Lorenzo fuori le Mura. The Almanac of Filocalus for 354 states that he was buried in the Catacomb of Cyriaca on the Via Tiburtina by Hippolytus and Justin the Confessor, a presbyter. One of the early sources for his martyrdom was the description of Aurelius Prudentius Clemens in his Peristephanon, Hymn 2. A famous legend has persisted from ancient times. As deacon in Rome, Lawrence was responsible for the material goods of the Church and the distribution of alms to the poor. 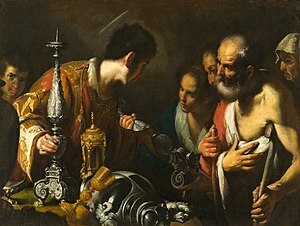 Ambrose of Milan relates that when the treasures of the Church were demanded of Lawrence by the prefect of Rome, he brought forward the poor, to whom he had distributed the treasure as alms. "Behold in these poor persons the treasures which I promised to show you; to which I will add pearls and precious stones, those widows and consecrated virgins, which are the Church's crown." The prefect was so angry that he had a great gridiron prepared with hot coals beneath it, and had Lawrence placed on it, hence Lawrence's association with the gridiron. After the martyr had suffered pain for a long time, the legend concludes, he cheerfully declared: "I'm well done on this side. Turn me over!" From this St. Lawrence derives his patronage of cooks, chefs, and comedians. Some historians, such as Patrick J. Healy, opine that the tradition of how Lawrence was martyred is "not worthy of credence", as the slow lingering death cannot be reconciled "with the express command contained in the edict regarding bishops, priests, and deacons (animadvertantur) which ordinarily meant decapitation." A theory of how the tradition arose is proposed by Pio Franchi de' Cavalieri, who postulates that it was the result of a mistaken transcription, the accidental omission of the letter "p" – "by which the customary and solemn formula for announcing the death of a martyr – passus est ["he suffered," that is, was martyred] – was made to read assus est [he was roasted]." The Liber Pontificalis, which is held to draw from sources independent of the existing traditions and Acta regarding Lawrence, uses passus est concerning him, the same term it uses for Pope Sixtus II, who was martyred by decapitation during the same persecution. However, this modern scholarship is disputed by author Janice Bennett, whose study of other primary sources indicates that the traditional narratives are substantially correct. Emperor Constantine I is traditionally held to have erected a small oratory in honour of Lawrence, which was a station on the itineraries of the graves of the Roman martyrs by the seventh century. Pope Damasus I rebuilt or repaired the church, now the Basilica di San Lorenzo fuori le Mura, while the Minor Basilica of San Lorenzo in Panisperna was erected over the site of his martyrdom. The gridiron of the martyrdom was placed by Pope Paschal II in the Minor Basilica of San Lorenzo in Lucina. St. Lawrence in stained glass window by Franz Mayer & Co.. He is holding a palm branch, a symbol for martyrdom, and a griddle, the instrument of his death. Papal Minor Basilica of St Lawrence outside the Walls (Basilica Minore Papale di San Lorenzo fuori le Mura: site of his burial and sepulchre. Church of St Lawrence in Piscibus (Chiesa di San Lorenzo in Piscibus), which is proximate to the Basilica of St. Peter. Due to his conspiring to hide and protect the written documents of the Church, Lawrence is known as the patron saint of archivists and librarians. Lawrence is one of the most widely venerated saints of the Roman Catholic Church. Legendary details of his death were known to Damasus, Prudentius, Ambrose, and Augustine. Devotion to him was widespread by the fourth century. His liturgical celebration on 10 August has the rank of feast in the General Roman Calendar, consistent with the oldest of Christian calendars, e. g. the Almanac of Philocalus for the year 354, the inventory of which contains the principal feasts of the Roman martyrs of the middle of the fourth century. He remains one of the saints enumerated in the "Roman Canon" of the Holy Mass as celebrated in the Latin Church. Lawrence is especially honoured in the city of Rome, of which he is considered the third patron after St. Peter and St. Paul. The church built over his tomb, the Papal Minor Basilica di San Lorenzo fuori le Mura, became one of the seven principal churches of Rome and a favourite place of Roman pilgrimages. The area proximate to the Basilica di San Lorenzo fuori le Mura is named the "Quartiere San Lorenzo". Because the Perseid Meteor Shower typically occurs annually in mid-August on or proximate to his feast day, some refer to the shower as the "Tears of St Lawrence". The shrine containing the gridiron that was used to roast St Lawrence to death according to tradition is in the Church of San Lorenzo in Lucina, Rome. His intercession to God is invoked by librarians, archivists, comedians, cooks and tanners as their patron. He is the patron saint of Ampleforth Abbey, whose Benedictine monks founded one of the world's leading public schools for Catholics, located in North Yorkshire (North East England). On his feast the reliquary containing his burnt head is displayed in the Vatican (Basilica di San Pietro?) for veneration. Within Anglicanism Lawrence's name is traditionally spelled Laurence or Lawrence. His feast is on 10 August which is in the calendar of the Book of Common Prayer, the volume of prayers which, in its 1662 format, was the founding liturgical document of a majority of Anglican provinces. In the Book of Common Prayer the feast is titled "S Laurence, Archdeacon of Rome and Martyr". His feast on 10 August has been carried into the contemporary calendars of most Anglican provinces, including the Church of England, which designates it as a lesser festival under the title "Laurence, deacon, martyr, 258". Anglo-Catholics venerate Lawrence, who is the patron of many Anglican parish churches, including 228 in England. A major church in Sydney, Australia, in the former civil parish of St Laurence, is known as "Christ Church St Laurence". The Anglican charitable society, Brotherhood of St Laurence also bears his name. According to Francesco Moraglia the role of deacon is distinguished by service of the poor. He is destined both to the service of the table (corporal works of mercy) and to the service of the word (spiritual works of mercy). "The beauty, power and the heroism of [d]eacons such as Lawrence help to discover and come to a deeper meaning of the special nature of the diaconal ministry." El Escorial, near Madrid, laid out in a grid pattern resembling a gridiron. Many churches, schools, parishes, towns, and geographic features throughout the world are named for Lawrence of Rome. Depending on locality they are named St. Lawrence, St. Laurence, San Lorenzo, St. Laurent, St. Lorenz or similarly in other languages. San Lorenzo del Escorial, the monastery built by King Philip II of Spain, commemorates his victory at the Battle of St. Quentin (1557) on the Feast of St. Lawrence. The monastery and the attached palace, college, and library are laid out in a grid pattern that resembles the gridiron of Lawrence's martyrdom. The gridiron of Lawrence is also thought the basis of the design of the Certosa di San Lorenzo di Padula, which is a monastery in Padula, Salerno, Italy. Two universities bear his name: St. Lawrence University (non-Catholic) in Canton, St. Lawrence County, New York, United States, and St. Lawrence University in Kampala, Uganda. On his second voyage, French explorer Jacques Cartier, arriving in the river estuary of the North American Great Lakes on the Feast of St. Lawrence in 1535, named it the Gulf of St. Lawrence. The river emptying into the gulf was named the St. Lawrence River. Many names in what are now Québec and the Maritime Provinces of Canada are references to this important seaway, e. g., the Laurentian mountains north of the city of Montreal, Saint-Laurent (borough), Saint Lawrence Boulevard which spans the width of the Island of Montreal, and St. Lawrence County, New York, United States near Lake Ontario. The rescue operation for the miners trapped in the 2010 Copiapó mining accident in Chile was named Operacíon San Lorenzo after Lawrence, patron saint of miners. In Freemasonry the Order of St. Lawrence the Martyr is a masonic degree whose ritual is based upon the story of Lawrence. It is one of the constituent degrees of the Allied Masonic Degrees. In Fargo, season 1, episode 3, Lorne Malvo notes the stained glass window of St Lawrence in Stavros' office, in response to which Stavros narrates his martyrdom, in "A Muddy Road". In the video game Dota 2 created by Valve, Lina the Slayer's dying voice line "Turn me over... I'm done" is a reference to Lawrence of Rome. ^ a b c Citing St. Donato as the original source. Janice Bennett. St. Laurence and the Holy Grail: The Story of the Holy Chalice of Valencia. Littleton, Colorado: Libri de Hispania, 2002. Page 61. ^ a b Citing Francisco Diago and St. Donato as sources. Janice Bennett. St. Laurence and the Holy Grail: The Story of the Holy Chalice of Valencia. Littleton, Colorado: Libri de Hispania, 2002. Pages 15 and 62. ^ Janice Bennett. St. Laurence and the Holy Grail: The Story of the Holy Chalice of Valencia. Littleton, Colorado: Libri de Hispania, 2002. Page 61. ^ a b c d ""St. Lawrence, Deacon Martyr," said to have been martyred by being put on a gridiron. St. Lawrence Orthodox Christian Church" (PDF). Archived from the original (PDF) on 19 October 2013. ^ a b "Moraglia, Fr. Francesco, "St. Lawrence, Proto-Deacon of the Roman Church", Vatican". ^ a b c Fr. Paolo O. Pirlo, SHMI (1997). "St. Lawrence". My First Book of Saints. Sons of Holy Mary Immaculate – Quality Catholic Publications. pp. 176–178. ISBN 971-91595-4-5. ^ a b c "Kirsch, Johann Peter. "St. Lawrence." The Catholic Encyclopedia. Vol. 9. New York: Robert Appleton Company, 1910. 9 February 2013". ^ a b c d Rev. Patrick Joseph Healy (1905). The Valerian persecution: a study of the relations between church and state in the third century A.D. Boston, Ma: Houghton, Mifflin, & Co.
^ Janice Bennett. St. Laurence and the Holy Grail: The Story of the Holy Chalice of Valencia. Littleton, Colorado: Libri de Hispania, 2002. Pages 58–60. ^ Parrocchia Santa Maria Assunta in Amaseno, Lazio, Italy; "I Luoghi di San Lorenzo a Roma"; ; accessed 13 March 2017. ^ Parrocchia Santa Maria Assunta, Amaseno, "I Luoghi di San Lorenzo a Roma", , accessed 13 March 2017. ^ See, for example, "An Anglican Prayer Book" (1989), the Province of Southern Africa, published by Collins Liturgical, ISBN 0 00 599180 3, Calendar, page 24. ^ See "Common Worship" (2000) core edition, published by Church House Publishing, ISBN 0 7151 2000 X, Calendar, page 12. ^ The Oxford Dictionary of Saints, published by Oxford University Press, ISBN 0 19 283069 4 (paperback), cites 228 churches. ^ The Church of England official index (ACNY) cites 224 spelt "Lawrence" and "Laurence". ^ Fodor's Review (2008). "Real Monasterio de San Lorenzo de El Escorial". ^ Johnson, William Henry (20 May 2007). French Pathfinders in North America. Gutenberg.org. Retrieved 27 February 2011. ^ "Saint Lawrence of Rome". CatholicSaints.Info. 26 October 2008. Retrieved 29 March 2017. Wikimedia Commons has media related to Saint Lawrence. Golden Legend: "The Life of Saint Laurence"